Tomatoes, corn & red bell peppers. 17 g per can protein. See nutrition information for sodium content. Per 1 Cup: 150 calories; 0 g sat fat (0% DV); 590 mg sodium (26% DV); 5 g total sugars. Nourishing ingredients. Crafted with care. No artificial colors or flavors. Purposeful ingredients. WhatsInMyFood.com. Questions or comments? Please call us at 1-800-710-7358. Visit our website at: www.wellyesfoods.com. Non-GMO. No preservatives. 11 g fiber per can. Say Yes! to Protein. We know you want to live life to the fullest. 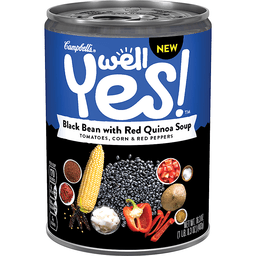 That's why we purposefully combine real nutritious ingredients, like black beans, chicken stock, and red quinoa, to give you a good source of protein and fiber. Non-BPA lining. Steel: Please recycle where facilities available.